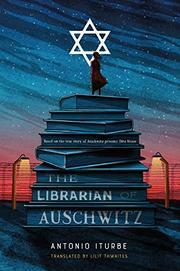 A teenage girl imprisoned in Auschwitz keeps the secret library of a forbidden school. Dita Adlerova, 14, is confined in the notorious extermination camp of Auschwitz-Birkenau. Compared to her fellow inmates, Dita’s relatively lucky. The several thousand residents of camp BIIb are inexplicably allowed to keep their own clothing, their hair, and, most importantly, their children. A young man named Fredy Hirsch maintains a school in BIIb, right under the noses of the Nazis. In Fredy’s classroom, Dita discovers something wonderful: a dangerous collection of eight smuggled books. The tale, based on the real life of Dita Polach Kraus and the events of 1944 and 1945, intertwines the stories of several real people: Dita, Fredy, several little-known war heroes, even a grim cameo from Anne and Margot Frank. Holocaust-knowledgeable readers will have suspicions about how many characters will die horribly (spoiler alert: this is Auschwitz). Yet somehow, myriad storylines told by multiple narrators offer compelling narrative tension. Why does BIIb exist? Will Rudi and Alice have a romance? What’s Fredy’s secret? Will Dr. Mengele subject Dita to his grotesque experiments? Dita’s matter-of-fact perspective, set in a slow build from BIIb to the chaotic starvation of the war’s end, both increases the horror and makes it bearable to read.